Salekhard, in Russia’s Far North, is the only city on the Arctic Circle. It’s May in Salekhard. Like everywhere else in Russia, people are heading out to the forest to barbecue, but in Salekhard, the grilling takes place in knee-deep snow. “I’m going on vacation in July, this time to the sunny Urals,” said Dima as he turns the meat over the coals and throws on some snow for more smoke. The southern foothills of the Ural Mountains would hardly be a summer destination for a Muscovite, but it’s different in Salekhard. It takes so much time to leave the city that its residents prefer traveling around Russia to overseas trips. There is not a single all-season road connecting Salekhard with the rest of Russia. In summer, a ferry service runs across the Ob River from the nearest railway station in Labytnangi; in winter it turns into an ice road, and in between, when the ice is still too thin for the bus, the locals have to walk to the station. There is also a river port and an airport, but the weather renders them almost unusable. In the early 1950s, Salekhard was one of the main base stations for the construction of the Salekhard–Igarka Railway (the Transpolar Mainline), designed to connect Murmansk and Arckangelsk to Chukotka in an attempt to effectively exploit the riches of the Far North. Construction of the Chum-Salekhard-Igarka Railway, a section of the Transpolar Mainline, began under Joseph Stalin, but the railway was never finished. The Chum-Salekhard and Salekhard-Igarka, codenamed 501 Railroad and 503 Railroad and dubbed “The Joyful 500” by locals, acquired one more name in the late 1950s – the “Dead Road.” This is the name that’s most popular now. Most of the road is now derelict; the bridges, camps and empty villages have fallen into decay. Some sections of the road are back in use with the development of natural gas production in the region. A new state program, Urals Industrial – Urals Polar, has been adopted, and the Transpolar Mainline was renamed the Northern Latitudinal Route. Under the new program, Salekhard will finally have a rail connection to the main network. Meanwhile, locals are still campaigning for the preservation and maintenance of prison camps as historical monuments. One of the camps is located in Salekhard – the old wooden building of the 501 Theater, where prisoners staged their own performances. 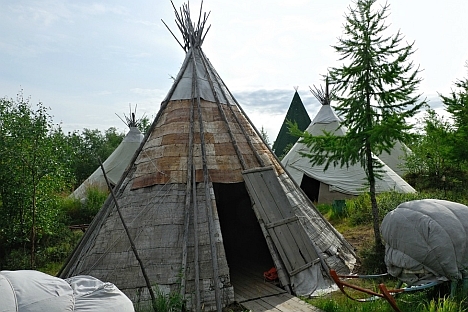 Salekhard is home to a large community of indigenous Khanty people. They sell venison, frozen cloudberry, fish, and fur coats in a local market. The reindeer herders bring their products to the market in traditional sledges drawn by modern snowmobiles. Khanty claim that reindeer fur clothes and footwear are the best protection against the cold. Salekhard, the capital of the Yamal-Nenets Autonomous District, hosts a festival of reindeer herders every spring, and their traditional reindeer skin tents made from poles, bark and felt, peacefully coexist with new panel houses in downtown Salekhard. Reindeer Herder Day is celebrated at the end of March, during the vernal equinox. Reindeer sledge racing and sledge jumping are the high points of the festival. There are very few old buildings in Salekhard; the oldest one is the Peter and Paul Cathedral, built by German architect Gottlieb Zinke in the late 19th century. In the mid-20th century, the church was used as barracks for convicts, then as a vegetable store and youth sports school. The church has since been restored. All the new buildings in Salekhard are made from panels and brick, standing on piles driven into the permafrost. It’s possible to travel to Salekhard by air from Novy Urengoy, which has a direct connection to Moscow. However, air service is not regular. In winter you can take a car on the ice road, but in summer there is no road to drive on. Another way to reach Salekhard is by rail, but only by the Tyumen-Kirov route. In Kirov, travelers must change trains to reach the town of Labytnangi and then either take the ferry or the ice road, depending on the season. Simply getting to the town from Moscow takes between four and six days. But for now, Salekhard remains an island of civilization amid endless tundra.